Secretary; Leah Carlisle, Treasurer; Edna R. Hollenbeck, Auditor; and Dorothy E. Orzalli and Edna McCarthy, Directors.Our first meeting was attended by 51 members and 119 guests. From 1949 to 1976 Soroptimist International of Auburn was a member of the Southwestern Region and we are currently one of 60 clubs in the Sierra Nevada Region. In 1981 we chartered a second club in Auburn—Soroptimist International of Historic Auburn. Our combined membership is currently approaching 55 members. Over the years, Soroptimist International of Auburn has been an active club both in the area of fundraising and community support. Lukens, the club organized a project through which we purchased medical equipment and loaned wheel chairs and other medical equipment to anyone needing these items. In 1960 we began the Silver Tape project on Lincoln Way to raise funds for the American Field Service. Soroptimist International of Auburn was very involved in spearheading the drive to establish a local hospital. Through our efforts, the efforts of the community and a group of dedicated local physicians, Auburn Faith Hospital (now Sutter Auburn Faith) was established. Over the years we have continued to be actively involved in the purchase of hospital equipment, partnering with Rotary in the purchase of an incubator and recently donating $1,000 towards an anesthesia machine for the birthing center. Several local fire jurisdictions have been the recipient of donations from our club through the purchase of waterproof salvage covers, turnout coats, a line gun and a smoke ejector. The Auburn Volunteer Fire Department was the recipient of a winch and cable in memory of Beth Lukens as well as a portable resuscitator. A resuscitator was also donated to the Foresthill Safety Club. their community in many other ways as well. 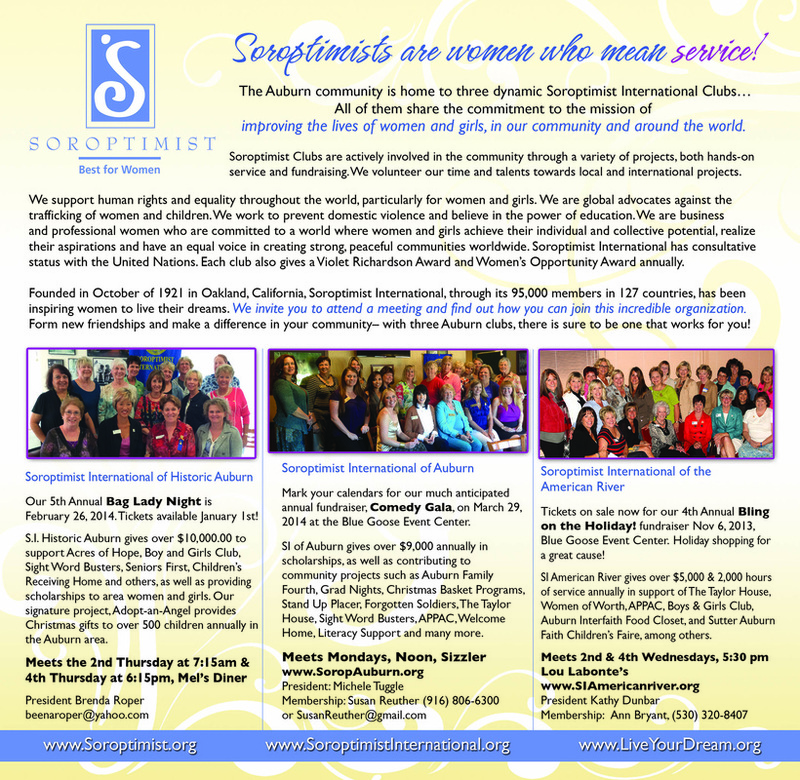 Many of our members have gone on to serve the Soroptimist organization at the region and federation level. We can proudly say we have served our community and the world in many different aspects!